Gripsweat - Northern Soul-Barbara Mason-You Better Stop It / Happy Girl-Arctic 154 D.J. 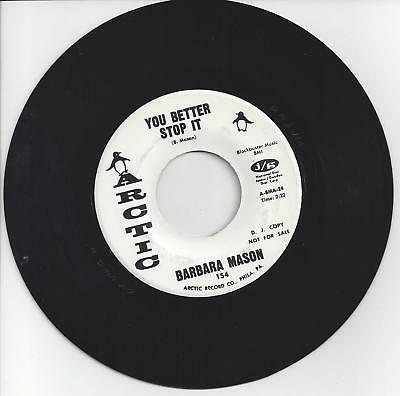 Northern Soul-Barbara Mason-You Better Stop It / Happy Girl-Arctic 154 D.J. Condition of Vinyl is Near Mint. Labels are clean. Please take a look at our other items for sale and auction in our Ebay store.You can do so by clicking the "view sellers other items" link on this page. I will adjust the postage rate for anyone that buys more than 1 Item. Just wait for me to send you the correct invoice before paying for the items.Buy more and save. (Postage in the U.S. with shipping and handling is Free.) Canada $12.00 . (U.K,Europe,Japan,Asia Australia & N.Zealand ( $15.00 ).All Shipments to Spain and Portugal will be sent either Registered or insured mail.Shipments to Italy require all packages to be sent by registered mail, no exceptions.Shipping is $ 35.00 first record & 2.00 each additional. I do not ship to Greece, Russian Federation or South America.Any overseas buyer that does not have a confirmed address will have there package sent either by registerd mail or by insured mail and will have to pay duties for there package.No exceptions. Orders over $ 75.00 may reguire extra postage or Registered mail shipping.We accept Pay Pal. Payment is expected within 5 days .Unless an item is defective all sales are final. Shipping charges include packaging. Check our feedback and bid or buy with confidence. NORTHERN SOUL 45 JIMMY DELPHS Dancing A Hole In The World CARLA 1904 Promo RARE! GARAGE SOUL The Inn Crowd YOU MUST BELIEVE ME Montel Michelle 45 rare! !